How To Make Your Children Your Best Friend: So many parents have made several mistakes in their family which never be reversed unless by the grace of God, in the lives of their children in a way that they have really thought of what to do in order to make things right, but it can never be possible anymore because they have failed totally as parents. In order words, it's not as if they did it intentionally, mostly they did it unintentionally, but they don't even know what to do to make things right. The best thing to do so as to make your children your best friend is to start on time, now is the best time, because if you are waiting until you have more time, you will miss it all. For the fact that you are a busy parent doesn't mean that you won't or you should not have some personal time for your children. It's a record of failure to so many homes today in the lives of their children, and when those children have fully grown, there will be no longer friendliness amongst them and their parents, it's a very bad and wrong record so to say. 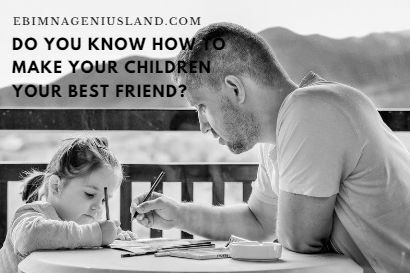 There are several ways to make your children your best friend, but we will list few ways and methods that have helped lots of families today. When parents lower themselves so low for their children, they will be able to know some hidden things about their children which they never knew has been happening in the lives and around their children. When you make your children see you so strict at all times, they will find it so difficult to discuss the activities of their days with you as their parent, because you have never told them anything that is going to make them open up to you. Every parent who is a storyteller to his children always finds a way to make those children talk to him/her. Many fathers have left the responsibilities of parenting for their wives, not knowing that they are losing a lot. A family that prays together lives together. When you make it so compulsory at least once or twice in a week to be a special day that you pray with your children, it will always ring in their heart that they will even remind you the days you might forget. Especially when you are a parent that lives the house very early in the morning and comes back so lately int evening, all the children have to ay to you every day is good evening dad/mom. It doesn't help issues, especially when you, are not a funny type or an amazing parent, who likes to joke or play with his children. These are some things that children enjoy eating even when they've eaten so much for the day, they can never get tired of eating or leaking lollipop, the reason is that it's very sweet and every child likes sweet things to compare to things that are bitter. Basically, in a normal basis, there are families that keep telling their children that sweet things will harm them, although they're too tender for that, you should always know that you will be their best friend if you always buy them that things that are their best in edibles. Many parents have failed in this area, in a way that they will never make it right anymore, and we are advising the upcoming parents to please take note of this line, it's very important. Every parent is supposed to be protective of their children no matter that child did outside, make sure you have to, first of all, protect your child outside. There are several parents who will see their children and other people's children fighting on the way, instead of te to protect their child, then they will start blaming their own children without even hearing them out first. For the fact that your child misbehaved outside doesn't mean that you should disgrace that child outside, so that the child will not one day disgrace you n the public as a parent. When you child does the wrong thing outside, you don't need need to teach her a lesson outside, all you need to do, is to take care of that child outside, and then, when you enter your home, you can now beat him/her the way you desire as a beating of correction. Make sure that whenever you are beating your child tell them the reason why you are beating them, so that they will not feel you juat like beating or punisihing them for no just reason. thanks, keep visiting for more inspiring posts.